We have developed War Years survey templates to include features and property issues with these Era properties. War Years properties dating back to the period 1918-1939 were often either working class housing built by local councils or middle class homes developed by private developers for suburban properties with the arrival of electricity and motor cars an important influence in their design. The new housing estates grew such as garden cities in Letchworth, Hertfordshire with its mix of housing types in a garden suburb style. Non-traditional building methods were experimented with and clearance of slums often with replacement multi-storey flats particularly in large cities such as London, Liverpool, Manchester and Leeds. Bungalows became popular too and between the Wars Tudoresque style houses often with a front bay were built of brick and frequently with cavity wall construction. The Modern Movement which banished any architectural decoration brought in a style of 1930s house building which was stark in comparison to styles previously seen in Britain with white rendered walls and wide metal windows. If you have a survey on a War Years property then take a look at one of our example surveys using our War Years survey templates developed over the many years we have been in the property sector. Download one of our examples below or call us for further examples. We have many, many survey sketches which we have commissioned to be hand drawn to be used within our survey reports. 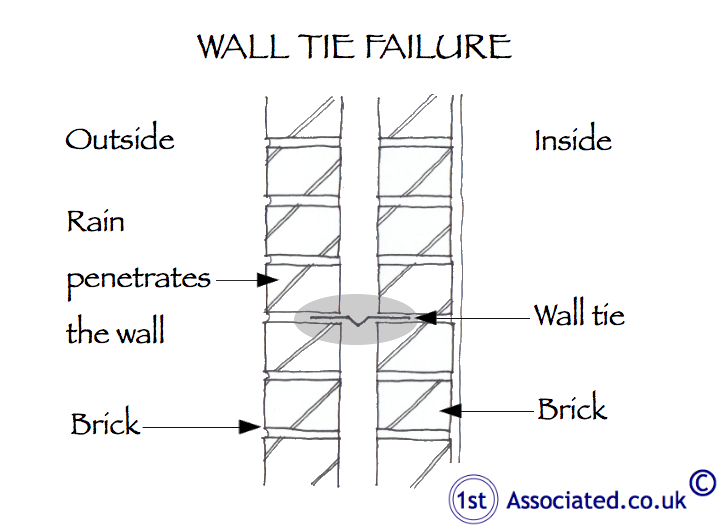 The adjacent survey sketch example shows Cavity Wall-tie Failure which leads to cracking due to the corrosion of the wall ties.